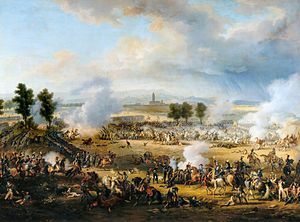 Is éard a bhí i gceist le Cath Mharengo (Béarla: Battle of Marengo; Fraincis: Bataille de Marengo; Gearmáinis: Schlacht bei Marengo) cath a tharla sa bhliain 1800 (14 Meitheamh), nuair a bhuaigh Napoléon Bonaparte ar an Mhonarcacht Hapsburgach in aice le Alessandria, an Iodáil. ↑ "Austria in the Age of the French Revolution: 1789–1815" (1 December 1990). Berghahn Books. Retrieved on 21 April 2013. ↑ "How Fighting Ends: A History of Surrender" (26 July 2012). Oxford University Press. Retrieved on 17 April 2013. Tugadh an leathanach seo cothrom le dáta an 10 Meitheamh 2017 ag 22:49.